MTN telecommunication company, recently launched a new welcomed sophisticated techy service that powers homes or your business places with electricity. 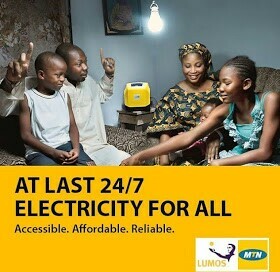 This is serving as an alternative to when there is no direct power supply from NEPA in Nigeria. This innovative idea that produced this Mobile electricity service, came to be in place as a result of the partnership between MTN and global solar experts company Lumos. Having this as a step in a right direction, I thought of sharing it with you fans, outlining some prerequisite facts you need to know. Read on as I lead you through with my simplified terms. You can also read: How To Use Call Waiting, Call Holding And Call Divert On MTN Network. Lumos‘power stations in a box’ is a new type of solar panel that gives Customers room to purchase electricity on their demand via their active MTN Numbers. Serves more for indoor unit. The Mobile electricity requires no charging unlike inverters. It was built to rely on solar energy, and as well your subscriptions from MTN network via your mobile line in order for it to function. With the Lumos Mobile Electricity Service, you able to get up to 80watts, which can go a long way in powering most of your household appliances/gadgets which include: your small television set, radio, fan, PC or laptop, hair clippers, mobile phones, and also 4 powerful LED lights very strong enough to light a room for 5-6 hours. The device came with a converter, users can convert the power type from DC to AC so as to enable them plug in highlighted appliances without causing any damage. So with Lumos Mobile Electricity Service, no need of buying fuel or diesel for your generators. As it can serve you through out once the subscription is intact. The mobile electricity is completely noiseless unlike generator sets that produce carbon-monoxide gas, and noise that destroy the ear drum (tympanum) So it's very far from health dangers. The device makes you feel better, as those annoying NEPA bills without light can now wait while you enjoy your light. Very easy to operate and set up set up when using it. The service is affordable and readily available at all MTN walk-In-Centres across Nigeria. You can get a guaranteed 24/7 uninterrupted power supply from the unit, with just a minimum of N200 naira daily subscription through your MTN line. mobile electricity service can offer to its customers at indoor units and those running small scale business that requires power supply. Endeavor to go for it if interested. Ensure to share this post to friends. Thank you.